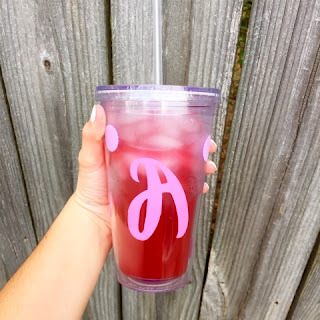 One of my favorite cold drinks from Starbucks is the Iced Passion Tea Lemonade but sometimes I just don't want to spend the almost $5 for it! So I have found an easy way to make it at home at a fraction of the cost! All of the ingredients can be found at your local Target! Score! First, boil 32 oz of water. Once it has boiled, pour the water over 1 tea bag in a 64 oz or larger pitcher. Let this steep for about 5 minutes and then remove the tea bag. (If you would like yours to be a little sweeter, then you can add sugar. I only added a 1/4 of a cup though.) The last step is to add 32 oz of lemonade to the tea. Stir and serve over ice! Enjoy!